So many of us struggle to get in our recommended five-a-day servings of fruit and vegetables. I think mainly the problem is we don’t always know how to fit it in and how to make them exciting, especially vegetables. To make sure I get my five-a-day in, I always make sure I have some form of greens on the side of my main dish. Whether that be salad, sauteed spinach, kale or colourful steamed, boiled or roasted veggies. There is no question that fruit and vegetables are an essential part of our diets, essential being a key word here as they’re so important for our health and wellbeing. However, it can seem a chore finding fun and exciting ways to include them into our diet. A side salad or plain boiled vegetables are fine every now and then, but they can become a bit boring if we don’t spruce them up a little. 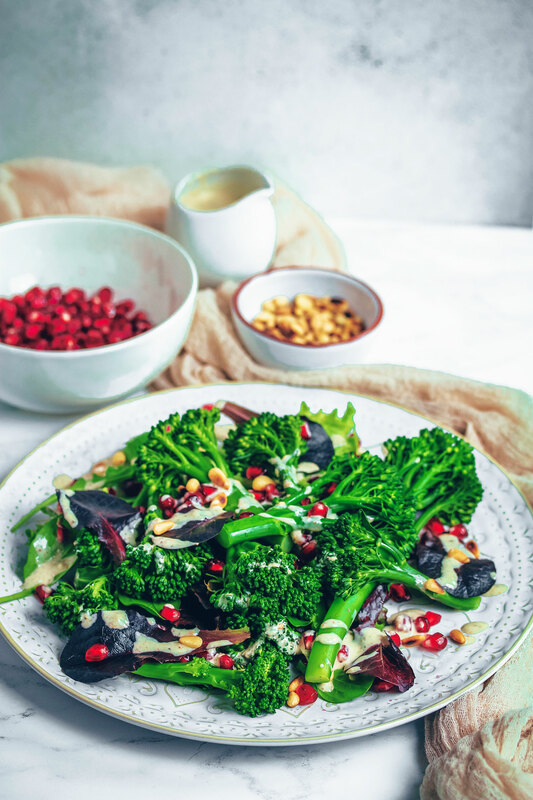 Tenderstem® have challenged me to come up with an exciting, yet simple way to incorporate their super healthy and delicious Tenderstem® into a side dish. Of course being brought up in the Middle East, my thoughts went straight to a Middle Eastern inspired side dish! Middle Eastern food is known for its aromatic and healthy sides. From hummus, baba ganoush, tabouleh and fatoosh. They can be extremely healthy and so good for the taste buds! 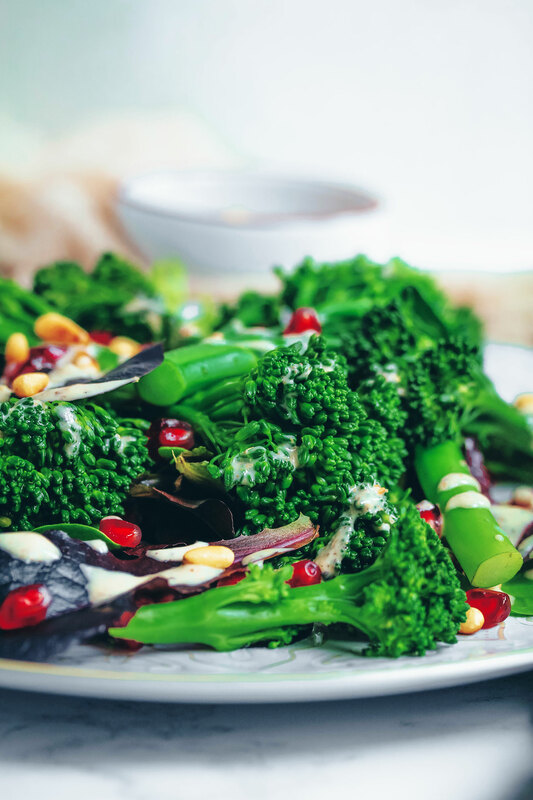 Many refer to Tenderstem® as broccoli, but it’s actually a cross between broccoli and Chinese kale (genius ideas!). Most people tend to simply boil, steam or roast it, but you can do so much more with this versatile vegetable! It’s really quick and easy to prepare – no chopping involved, just a quick rinse with suffice! Don’t be tempted to chop off the stem. As you may have gathered from the name, the stems are actually really good for you, and once cooked they’re lovely and soft and not fibrous like regular broccoli stems tend to be. 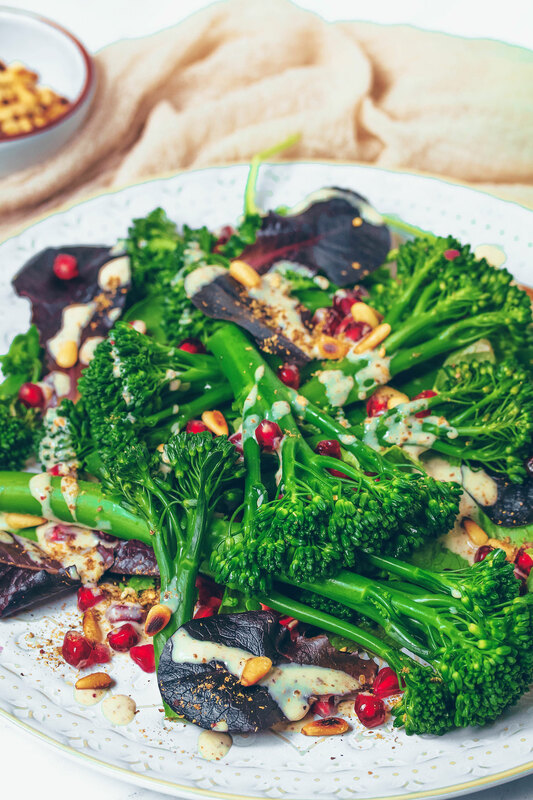 So for this Middle Eastern Tenderstem® Salad, I’m simply boiling the Tenderstem® for 3-4 minutes (don’t boil for any longer, you’ll get rid beneficial nutrients as well as its beautiful vibrant green colour! ), then i’m tossing it with mixed salad leaves, pomegranate seeds, pine nuts and a delicious homemade tahini and za’atar dressing. Tahini and za’atar are both essential ingredients in Middle Eastern cooking and they work so well together. Add the Tenderstem to a pan of boilg water, lower the heat and simmer for 3-4 minutes. Drain and rinse under cold water for a few seconds. 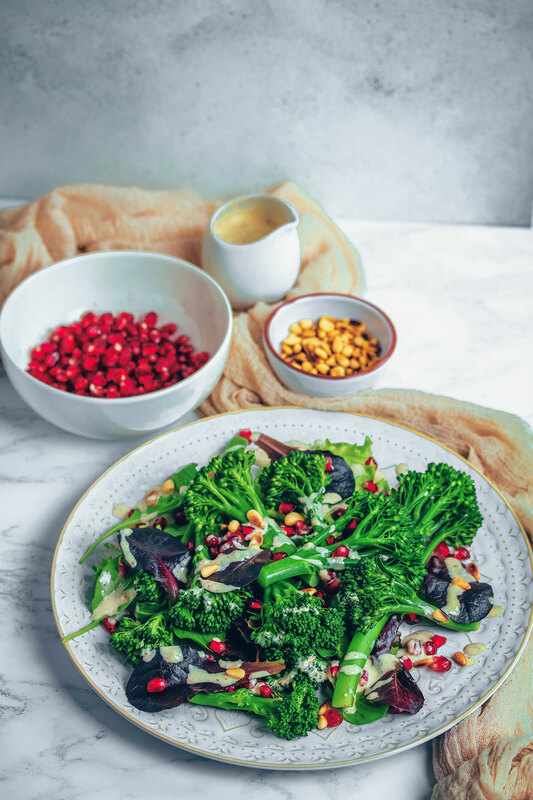 Arrange on a plate with the salad, pomegranate seeds and toasted pine nuts. Mix the dressing ingredients in a bowl, then drizzle a generous amount on the salad before serving. 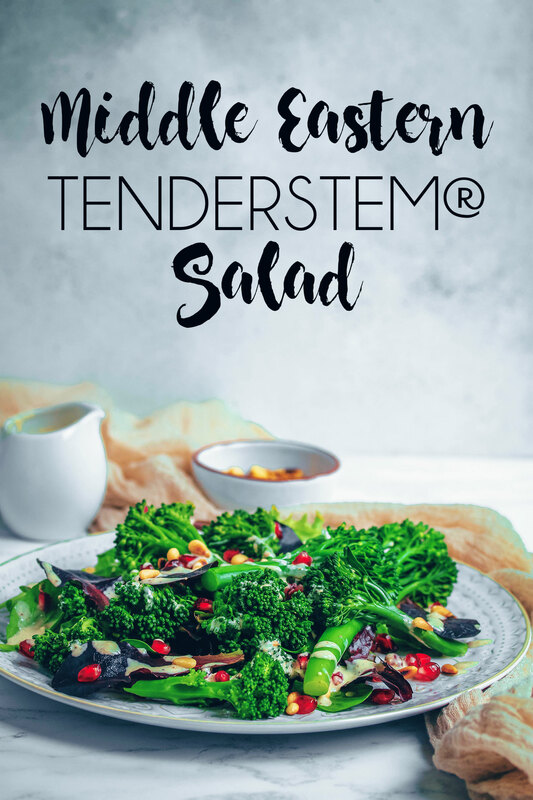 Thanks to Tenderstem® for sponsoring this post. Commissioned posts is how I’m able to continue working on the blog and creating recipes and recipe videos for you. As always, all opinions are my own. Gorgeous colour and flavour…those broccolini look absolutely amazing! I love the vibrant green colour too 😀 Thank you Dee! I love long stem broccoli like tenderstem, it’s the only kind I eat, so new ideas on how to cook it are very handy! Yeah I prefer Tenderstem to broccoli too! They’re so much less faff as well since they don’t take any time to prep. This looks so vibrant and green and you’re right the stems look super tender. I love greens and it doesn’t somehow feel right if I don’t get some in every day. I agree with you Choclette, I need to have some sort of greens or vegetables to balance out my plate. My meal doesn’t feel complete otherwise! I love Middle Eastern salads! Always such a nice combo of textures and flavors. And the contrast of the green veggies and pink pomegranate seeds is so lovely! That dressing must be AMAZING on this salad! Looks so yummy Nadia! This looks lovely – so colourful and delicious. I love salads that use cooked vegetables like this. They make a lovely change from endless leaves & raw veg!